"Twenty years from now you will be more disappointed by the things that you didn't do than by the ones you did do. So throw off the bow lines. Sail away from the safe harbor. Catch the trade winds in your sails. Explore. Dream. Discover." An international organization created to share cruising experiences through a monthly Commodore's Bulletin. If you are interesting in finding out about the cruising life, check this site out. Riley & Elayna, an Australian couple document their journey traveling the world by sail despite no previous sailing experience. Since late 2014 they have been filming their adventures on YouTube full-time as they have crossed the Mediterranean, Atlantic, Caribbean, and Pacific Ocean. They have suffered terrifying storms, pirate scares, financial breakdowns, equipment failures, water shortages, and other ‘interesting’ mishaps but wouldn’t trade living on the Sea and traveling wherever the wind takes them for anything. Distant Shores is a sailing television and DVD series about the cruising life, with lots of tips for sailors planning to sail away plus destination information to help you make your cruising plans. An excellent site for cruisers to obtain cruising information and the latest facts on the Intercostal Waterway (ICW). Dashew Offshore, Beowulf Publishing, and the FPB team have made these books: Mariner’s Weather Handbook, Surviving the Storm, Practical Seamanship and Offshore Cruising Encyclopedia available free as PDF files. This group of books are excellant guides from a couple who have extensive cruising and yacht design experience. Go to the site and click on the links to download these publications. SailNet was launched in 1994 as a resource where sailors could find everything they needed to support their own pursuit of the sailing lifestyle. Since then SailNet grew to become one of the best Internet site for sailing. It has been recognized four years in a row as one of "Forbes Best of the Web" for content, resources and community. Let shoreside relatives and friends feel a part of your next voyage by plotting your daily positions on the web. The service is free and there are other benefits. Skipper Bob and his wife Elaine cruised more than 44,000 miles on the East Coast of the United States. Their travels have taken them up and down the Intracoastal Waterway numerous times. 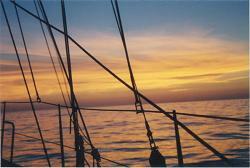 They completed the Great Circle Route and sailed to both the Bahamas and the Dry Tortugas. They took their trawler through the Erie, Rideau, Richelieu, and Trent Severn Canals. Living aboard for more than 9 years on both a sail boat and a trawler, they have experienced just about everything the waters of the East Coast have to offer. Skipper Bob passed in December, 2006, but his publications are available on Amazon. A general description of the 1200 mile waterway for vessels passing from Norfolk, Virginia to Florida. This site has a number of useful links for Charts and Chartbooks, connecting waterways and towns and parks along the way. 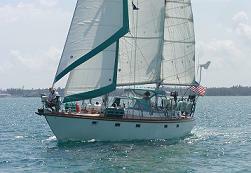 Annual rally from Norfolk, Virginia to Tortolla, BVI. 90+ boats plan to participate in this educational, well planned, excellent way to get to the islands in November. Jimmy Cornell's one-stop website provides all essential information to sailors planning an offshore voyage anywhere in the world. A wonderful, pristine paradise in the Bahamas! We went for 3 days and stayed for 3 weeks. Bill Biega's Recommended and Favorite Sailing Areas - Antilles, Atlantic, Bahamas, British Virgin Islands, Grenadines, the Mediterranean, Dry Tortugas, Whitsunday Islands - for great adventures from someone who's been there. This site lists a number of charter destinations in both Eastern and Western Caribbean to give you a feel of what's available. All you wanted to know about the Canal, including a live web cam updated frequently. A romantic luxury Bahamas hotel and resort on exotic Green Turtle Cay in the Out Islands of Abaco (and a great place to anchor). Maretron designs, manufactures and markets leading-edge marine electronic instrumentation for recreational and commercial boating. Significantly these products are designed to the open industry NMEA 2000® standard, which allows electronic equipment from diverse manufacturers to be networked together to share information throughout the vessel. This standard and it's implementation is the wave of the future and will help eradicate the problems caused by 'proprietary only' systems like Raymarine. From recreational boating to deep sea commercial marine, Furuno offers the single largest line of marine electronics - and their field support is excellant. Chartplotters, Depth Sounders and Sonar, Fishfinders, Handhelds, and Radars - I still have my handheld and discontinued GPS 48 unit and it works great. The Track IT TV website has a great, up-to-date discussion on the various aspects of obtaining Internet access while on your vessel. Most everyone knows that you can get Wi-Fi access while in marinas, but what about while underway. This set of FAQs covers the Verizon offering, and also the new BGAN (Broadband Global Area Network) systems by Stratos are an example of this emerging technology. Most cruisers are aware of the capability of using their Single Side Band (SSB) for limited email communications, but what if you don't have a SSB? Skymate offers a new, relatively inexpensive system with world-wide coverage for email, weather, position reporting, and vessel monitoring that looks quite nice. This site is the best one I've seen for teaching in an animated manner all knots needed by Yachtsmen; Climbers; Fishermen; Scouts; Arborists; and Search & Rescue Workers. An great article describing how many of the mariner's needs for navigation information, weather, vessel maintenance and spares procurement, email, texting, phone useage, tides and currents, route planning, etc can be performed with a smartphone aboard your vessel. If you are not aware, the costs to do so are far less than chartplotters and conventional marine electronics. Active Captain provides the local knowledge you need for marinas, anchorages, local knowledge and hazards on the navigation software that you use (over 24 navigation programs for Android, Windows, Apple OS, Linux, Android, Apple IPhone and IPad are available). You typically load the navigation software and then load Active Captain information on top of it. All users are enabled to provide comments on marinas, anchorages, local knowledge, etc. which provides a wonderful amount of information to the cruiser. I navigate with this information exclusively, and, would not be without it. My particular choice is MX Mariner with Active Captain data loaded with it. An excellant review about 5 different Android smartphone marine navigation apps. Many navigation and charting apps are now available for the iPhone, iPad, and iPod Touch and Android devices. A free (and excellent) Windows tide and current prediction program. Weather for any US city and state and local marine weather. Hourly updated weather data from moored buoy and C-MAN stations. Coastal Waters Forecasts are subdivided by zone, each identified by text description. National Weather Service Marine Information. Ship-Routing and Weather Forecasting for Vessels on the High Seas. Herb Hilgenberg's private navigation advice was so trusted, American and Canadian search and rescue agents have called him to find boats that are missing. Unfortunately, the NET, which operated daily for over 25 years until June 2013, remains closed. The Netherlands University provides Gulf Stream visual currents that are updated weekly. Professional Satellite Oceanographer produces realtime ocean charts (Gulf Stream/major world currents) for sailboat racing, boat deliveries, ocean cruising, and offshore fishing. Bermuda current conditions and weather forecast included detailed marine forecasts. Free Mariner's Weather Handbook by Steve and Linda Dashew. Provides a complete and exhaustive guide to the basics of every aspect of weather you are likely to meet when cruising. Power Boat Builders by Country. 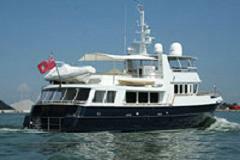 Yacht Manufacturers Directory and Information Center. If you are considering buying a new or used yacht (Power or Sail), ocean yacht, luxury yacht, trawler or super yacht, this is the page for you. Provides impartial and uncompromising evaluations of today's boating equipment and gear. They take the guesswork out of boat and gear buying. A wide variety of Boat Tests to enable prospective owners to get good insights into a vessel prior to purchase. consists of a series of free, downloadable nautical books that cover a variety of information important to navigators of coastal and intracoastal waters and the Great Lakes. These free, downloadable publications contain a list of lights, sound signals, buoys, daybeacons, and other aids to navigation. All you want to know about documenting and documented vessels in the United States. All you want to know about the shots you'll need in all those far off places. All you want to know about the user vessel decals and transponders for vessels re-entering the United States. Annually purchase border-crossing transponders or decals for commercial vehicles, private vessels, or private aircraft, all online. The source for nautical charts (paper print on demand and electronic) and related publications.